Chosen by the Raiders in the second round of the 1962 AFL draft, Alworth’s draft rights were obtained by San Diego (he was picked by the 49ers in the first round of the corresponding NFL draft). Due to injuries, he had a quiet rookie season, appearing in four games and catching 10 passes for 226 yards, although three of those went for touchdowns. Alworth broke out in 1963 with 63 catches for 1205 yards (19.8 avg.) and 11 TDs. He received AFL Player of the Year honors from UPI in addition to being a consensus first-team All-AFL and AFL All-Star selection. Chargers went 8-5-1 to finish first in the AFL Western Division. Lost AFL Championship to Buffalo Bills (20-7). The 1964 season was the second of seven straight 1000-yard receiving seasons for Alworth, three in which he led the AFL, and four straight (of an eventual five) years in which he reached double figures in receiving TDs (he led the league again in 1965 with 14 and with 13 in ‘66). With his speed, finesse, and great leaping ability, Alworth led the AFL in pass receptions three times, was a consensus 1st-team All-AFL honoree for six straight years, and was selected to seven consecutive league All-Star games. Alworth spent his last two seasons (1971 and ’72) with the Dallas Cowboys and scored a touchdown in the Super Bowl VI win over Miami. Overall, the graceful receiver known as “Bambi” caught 542 passes for 10,266 yards (18.9 avg.) and 85 touchdowns (458 for 8976 yards with 77 TDs came in the AFL). His string of 96 consecutive games with a catch was the AFL/NFL record at the time. 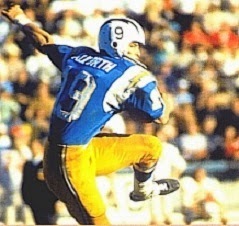 Alworth’s #19 was retired by the Chargers and he was inducted into the Pro Football Hall of Fame, Class of 1978 (the first inductee whose career was primarily in the AFL).